Lately I have noticed that most of the incenses available nowadays on the market are either heart-racing manic blends, or put-you-to-sleep herbal scents. 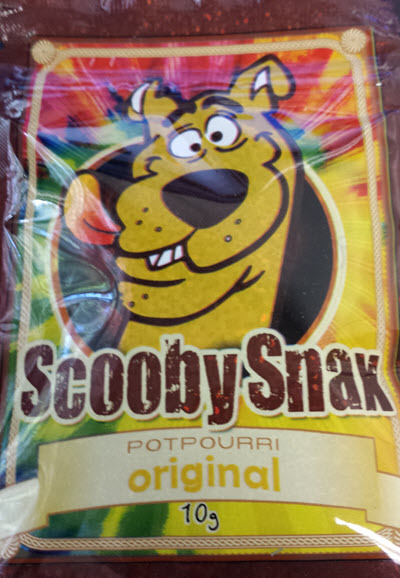 Scooby Snax is nice in that. I didn’t feel the urge to pass out and sleep the day away. I felt more like a blank slate – ready to take on whatever came my way. Creativity is the name of the game here, with nice bright thoughts that encouraged me to get up and do things without feeling dull or stupid. We had a birthday party BBQ and I thoroughly enjoyed Scooby Snax and my company! It was a perfect way to get away from all the hustle and bustle, sneak off to my room, light up my trusty incense burner and kick back for 5 quiet, peaceful moments, basking in the scent – which was a nice sweetish vanilla smell. Then I’d rejoin the party, none the wiser, and me definitely more relaxed and happy. I can tell you that one medium-sized pinch lasted me 45-60 minutes or so with occasional relighting.